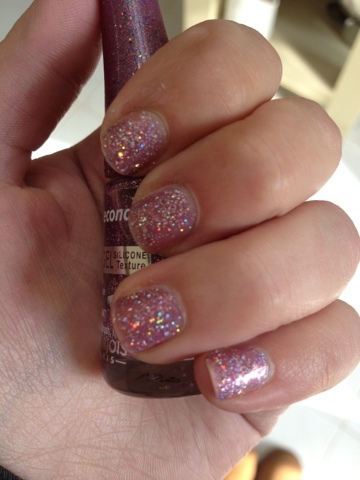 I picked Bourjois 1 second polish up in Rainbow Apparition after seeing Katie's blog post. I love any glitter polish and immediately fell in love with this as it looked like a more purple version of the OPI Katy Perry Collection Teenage Dream (blogged about here). It has a lilac gel sheer base with smaller and larger particles of Glitter running through to build up an almost holographic type effect. The difference between Teenage Dream and this though I find is that the Bourjois colour isn't quite as sheer as Teenage Dream so it can easily be worn without wearing a base colour, whereas with Teenage Dream I almost always wear a pink base coat with it. 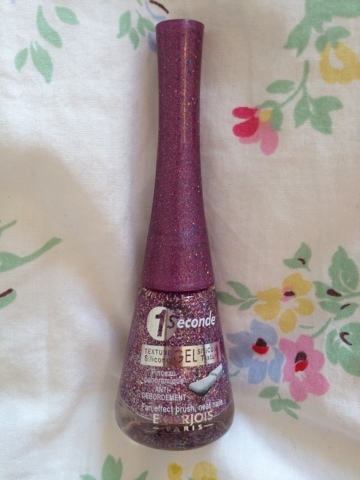 This has a shorter wider brush on it for easier application, I do find it's almost a little too wide for my nails though as I end up with glitter on the skin around my nails, not a huge issue though as you can easily rectify it, the gel like texture though also means it takes a little longer to dry in between coats I find so not one to use if you are in a rush. Overall, I really like this, it looks really cute on, very girly and sparkly, which is always a bonus! The name Rainbow Apparition is definitely apt as well as it really does show every colour of the rainbow when it catches the light. 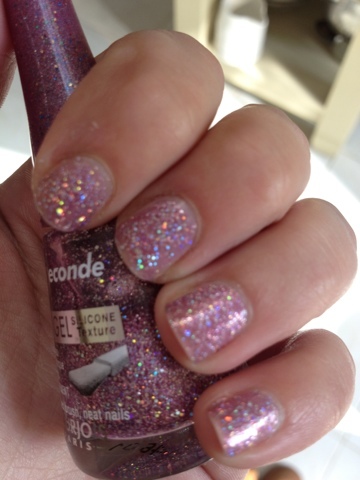 This could look really cute over Barry M's Berry Ice Cream - review here! I picked mine up in Boots for £5.99 and they are also doing a 3 for 2 offer across Bourjois products at the minute. 6 comments on "NOTD: Bourjois Rainbow Apparition"
I'll have to remember to pick this up at the weekend, your review is great, the formula of the polish sounds great and the brush! Such a gorgeous polish! 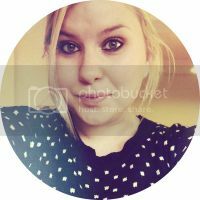 Blogs I like to interact with other countries to learn about new products and new people. Do not mind my English .. Using the translator.